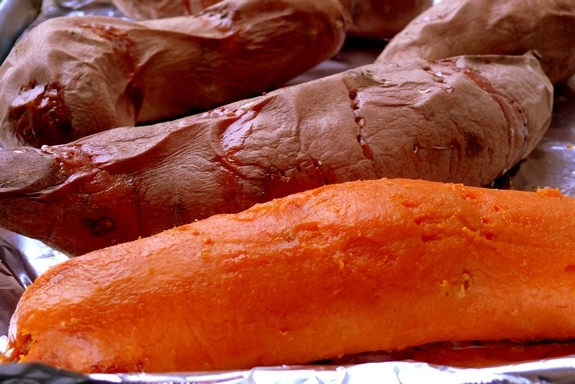 Attempt 4,325,654 to make sweet potatoes look good in a photograph. 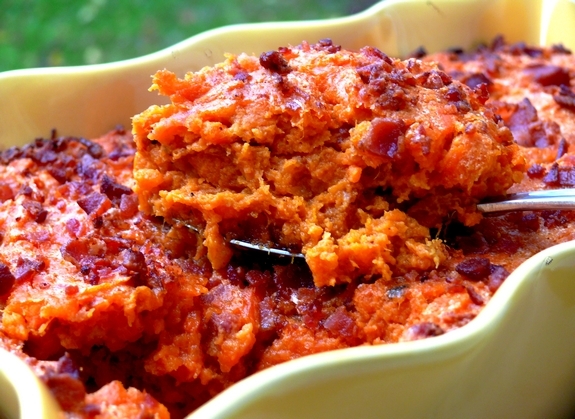 Still not happening, but who cares when you have this crunchy, sweet, smokey, light and fluffy sweet potato dish to eat. Now, I do believe in the traditional Thanksgiving dishes, the same ones your family serves every year…BUT I think every year should have a couple new ones mixed in…namely this one. When I saw this made on TV, I knew I had to have it. I think it was the bacon. No, I know it was the bacon. I highly suggest giving it a try so that bacon becomes part of your Thanksgiving, if it isn’t already. Preheat oven to 400o F. Roast the potatoes on a sheet tray until fully cooked, about 1 hour. Set aside until cool enough to handle. Meanwhile cook the bacon in a large skillet over medium-high heat until crisp. Remove and drain on paper towels, reserving the rendered bacon fat. Chop bacon and set aside, reserving 1/4 cup for garnish. 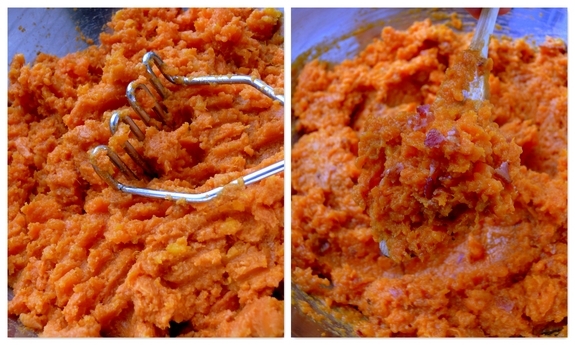 Peel the sweet potatoes and mash them. Add the potatoes to a large bowl. Stir in the chopped chipotle (remove the seeds if you want to lessen the heat), adobe sauce, maple syrup, chopped bacon and egg yolks. Mix together until combined. Season to taste with salt and pepper. In a separate large bowl, whip the egg whites until stiff peaks form. 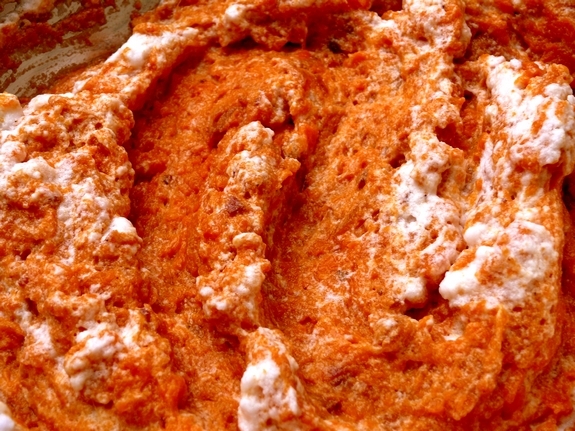 Add 1/3 of the whipped egg whites to sweet potato mixture and fold to create a lighter base. Fold in remaining whites until just incorporated, leaving some white streaks. Grease a 2 quart baking dish with some of the reserved bacon fat and gently pour in the sweet potato souffle mixture. Sprinkle with the remaining chopped bacon. Put the baking dish on a sheet tray and bake 40 minutes. You will love it. Preheat oven to 400 degrees F. Roast the potatoes on a sheet tray until fully cooked, about 1 hour. Set aside until cool enough to handle. Grease a 2 quart baking dish with some of the reserved bacon fat and gently pour in the sweet potato souffle mixture. Sprinkle with the remaining chopped bacon. Put the baking dish on a sheet tray and bake 40 minutes. Of course it was the bacon! This does sound delicious! Given that my photography skills are sorely lacking I have no suggestions on making sweet potatoes more photogenic, except maybe wrap them in more bacon. This absolutely fantastic! Wow, what an incredible side-dish. sweet potatoes aren’t very photogenic, are they? but you managed to make this look delicious just the same! yum. PERFECT! I’ve been looking for a savory sweet potato side. I mean, I love the typical sweet mousses or pone, but I’m switching the recipes up this year and needed a savory sweet potato dish. Thank you!! 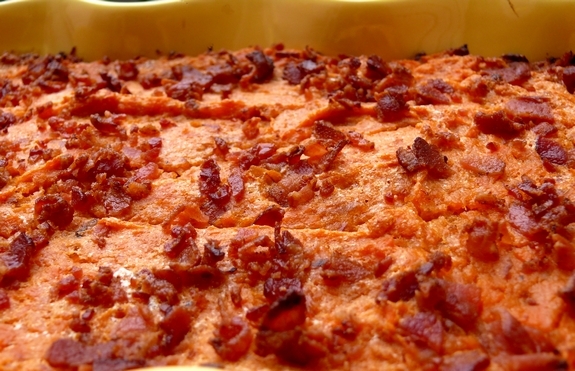 bacon and sweet potato are like heavenly together. your souffle looks sooo good cathy. i wish there was smellovision right now. My Texas family is going to love this! Claire’s Thanksgiving special was pretty incredible but this was definitely the star for me. Both my mom and I flagged it to make on the big day – so psyched you gave it a test run for us! Thanks for sharing! Any idea if this can be made ahead and stored in the frig until time to bake? I wasn’t sure if it was possible since it has eggs. Looks delicious! Yes, make it the day before and store. Bring it to room temp before baking. Made this for Thanksgiving dinner and it’s already been requested to become THE sweet potato dish every year. Might cut back the maple and kick up the chipotle a little. The heat was a nice contrast to the unctuous feel and relatively bland taste of the traditional dishes. And everything IS better with bacon. Great recipe. Thanks.